Galina Sergeyevna Ulánova (Russian: Галина Сергеевна Уланова) (January 10, 1910 – March 21, 1998) was regarded by many as the greatest Soviet ballerina of the twentieth century. Her apartment in Moscow is designated a national museum, and there are monuments to her in Saint Petersburg and Stockholm. Ulanova studied in Petrograd (now St. Petersburg) under Agrippina Vaganova and her own mother, a ballerina of the Imperial Russian Ballet. When she joined the Mariinsky Theatre ballet company in 1928, the media of the day noted that she had "much of Semyonova's style, grace, the same exceptional plasticity and a sort of captivating modesty in her gestures." Konstantin Stanislavsky, fascinated with her acting style, implored her to take part in his stage productions. In 1944, when news of her fame reached Josef Stalin, he ordered her transferred to the Bolshoi Theatre, where she became the prima ballerina assoluta for 16 years. The following year, she danced the title role in the world premiere of Sergei Prokofiev's Cinderella. Ulanova brought more to her performances than technical perfection, by delving into her characters and giving them life. She was as much an actor as she was a dancer and for that the world embraced her. In retirement, she began teaching and imbued in her students a legacy to continue her artistry. Galina Ulanova was born in St. Petersburg, Russia, on January 8, 1910. She was the only daughter of Maria Romanova and Serge Ulanov, members of the ballet company of the Mariinsky Theater. The first performance she saw featured her parents, and Ulanova recalls, "True, my first visit to the theatre fired my imagination, but I was not swept off my feet by that strong impulse for a stage career which precipitated so many to the footlights." And, indeed, Ulanova resisted when her mother gave her ballet lessons, protesting that she did not like dancing. 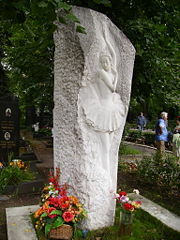 At the age of nine, Ulanova was unwillingly enrolled in the Petrograd School of Choreography, weeping bitterly. However, her parents found it necessary, because their dancing and teaching schedules prohibited them from finding the time to care for her. At the school, Galina's first teacher happened to be her mother. She pleaded with her mother for permission to withdraw from the school, and the two agreed that if, come New Years Day, Galina was still unhappy, she would be allowed to leave. However, by year's end Galina had made friends and was excelling in her classes. Ulanova's first onstage experience came as a little bug in Riccardo Drigo's Caprices of a Butterfly. The performance gave Galina a great thrill, especially as she made no mistakes. She was then cast as a bird in Rimsky-Korsakov's Snow Maiden. Gradually, Galina's love for ballet developed, and her final four years at the school were spent under the tuteledge of Aggripina Vaganova, the famous teacher whose notation of the Russian classical ballet system is still used today. Eventually, Galina's social life began to expand beyond the school, and she associated with the intellectuals of her time, who would gather at someone's home after performances to discuss all the arts. Galina was fascinated by the theories of Konstantin Sergeyevich Stanislavsky, applying his ideas to her dancing. Although she performed Swan Lake flawlessly, only four months after her debut, she was not satisfied, feeling as though she had performed the steps without understanding their deeper meaning; indeed, she claimed that she had danced Swan Lake a hundred times before she understood the ballet beyond the steps. At her graduation recital in 1928, Ulanova performed the seventh Waltz and Mazurka of Les Sylphides and the Adagio from The Nutcracker. Her movements, both fluid and ethereal, won her a coveted place in the Mariinsky Ballet Company (now usually referred to as the Kirov Ballet). She was quickly recognized for the quality of her dancing, and she made her professional debut as Princess Florin in Sleeping Beauty. Afterwards, she again danced the role of the Swan Queen in Vaganova's own production of Swan Lake. She was known for bringing sensitivity and poetic lyricism to the role, but it wasn't until 1934, in Rostislav Zakharov's The Fountains of Bakhchiserai that she showed her unique talent for the dramatic. Ulanova was cast as Maria, the captive, beautiful, harem girl, and brought powerful drama to Pushkin's story of love, jealousy, and murder. A room in Galina Ulanova's apartment, now a museum, Moscow. For Ulanova, preparing for her roles became more than simply a question of learning the difficult technical steps. Rather, she studied the character as an actress would, looking for nuances to shade and develop the role. Her performances expressed great musical quality as well. She would bring life to both the character and the musical score, and was in fact often surprised with the adulation she received after her performances, as she believed her own personality had nothing to do with the "real" person she had been dancing. 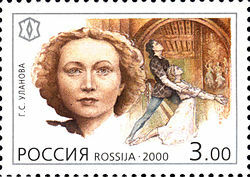 The year 1940 brought a clear illustration of this, with Ulanova's performance in Romeo and Juliet, in which she played the role of Juliet. Adapted for ballet by Soviet composer Serge Prokofiev, his score was inspired by and composed with Ulanova in mind. Ulanova was praised for her performance by audience and critic alike, as she brought beauty, sensibility, anguish, and despair to life through Juliet. The success of Romeo and Juliet led Ulanova to focus on ballets in which she could truly create her own characters, which most traditional ballets, like The Nutcracker, did not. Some of the roles she created can be seen in ballets such as The Red Poppy, The Stone Flower, and Cinderella. During World War II, she performed for Russian soldiers in Moscow, after her company was evacuated from St. Petersberg. She moved to Moscow permanently in 1944, joining the Bolshoi Ballet Company at the request of Joseph Stalin, who had by then heard of her fame and renown. The Iron Curtain made it difficult for the Western world to experience and appreciate Ulanova's talent. However, in 1945, she made her first western appearance, in Vienna. In 1949, pro-communist sentiment in Rome made it easier for her to perform there. In 1951, she performed in Florence and Venice. In 1956, she reprised her role as Juliet in Romeo and Juliet at a performance in London. At this performance, many expected that that the 46 year old Ulanova would be too old to meet the physical demands of the role. But American and British critics alike were overwhelmed by Ulanova's flawless technique and her ability, as an actress, to bring humanity to her roles. Enraptured British papers wrote that "Galina Ulanova in London knew the greatest triumph of any individual dancer since Anna Pavlova." Ulanova retired from stage appearance in 1962, but continued to work for thirty years at the Bolshoi Ballet as a teacher. She taught many of the top ballerinas to come through Bolshoi, such as Maximova, Semenyaka, Semizorova, and Grachova. She also accepted invitations to coach in other countries, such as Australia and Sweden. She worked quietly, watching her pupils, elegantly demonstrating when needed. She developed individuality and high standards in each dancer she taught. Ulanova's performances became a universal pleasure. Every Soviet citizen, from peasant to politician, enjoyed watching her perform. And when she was allowed to go overseas, her reception was just as warm. Throughout her life, she made a habit of advocating for dance, writing about it and serving on the jury for international ballet competitions. She received the Stalin Prize in 1941, 1946, 1947, and 1951. She received the People's Artist of R.S.F.S.R. in 1951, and the Lenin Order in 1974. She won the Soviet Union's highest honor, the Hero of Socialist Labor, twice. In 1981, UNESCO sponsored an evening in Paris devoted to Ulanova, presenting the ballet In Ulanova's Honor. 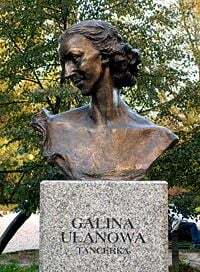 In 1984, a statue of Ulanova was installed in Stockholm, Sweden (sculptor E.A. Yanson-Manizer, 1984), and a bronze bust of her was unveiled in 1984, in St. Petersburg (sculptor M.K. Anikushin). She was awarded the Anna Pavlova Prize of the Paris Academy of Dancing (1958) and the Oscar Parcelli Prize "Life for the Sake of Dancing" (1988 Milano). She is an Honorary Member of the US Academy of Arts and Sciences; and has received the Comandore Order for contribution in the sphere of art and literature (France, 1992). Ulanova is generally regarded as the greatest dancer of the twentieth century. And thanks to her skills as a teacher, when she died at the age of 88, Russia could console itself that her legacy would live on through those she had taught. Sergey Prokofiev: She is the genius of Russian ballet, its elusive soul, its inspired poetry. Ulanova imparts to her interpretation of classical roles a depth of expression unheard of in twentieth century ballet. Evgeny Mravinsky: The image of Ulanova–gentle, fragile and wise—was given to me in my early youth and is rooted in my heart and memory forever. Each encounter with Ulanova and her art, each memory of her—is always a great thrill and happiness. With thanks to her and gratitude to Fate for having given her to us. Sviatoslav Richter: Ulanova has charted new paths in ballet… Not only has she given us unforgettable characters, she has created her own artistic world–a realm of human spirituality… Ulanova has transformed ballet into a popular art form. Thanks to her even its most implacable enemies have become its supporters and thousands of people now acknowledge ballet to be a vital necessity. Margot Fonteyn: I cannot even begin to talk about Ulanova’s dancing, it is so marvellous, I am left speechless. It is magic. Now we know what we lack. Maya Plisetskaya: Ulanova has created her own style, has schooled us to it. She represents an epoch, a time. She has her own hallmark. Like Mozart, Beethoven and Prokofiev she has had an impact, she has reflected her age. Maurice Bejart: Galina Ulanova is a ballerina who has grasped the profoundest secrets of art, she has united feelings and their outer expression into an indivisible whole. Rudolf Nureyev: Only she, the world’s Number One ballerina, kept unswervingly to her chosen course, always unassuming, modestly dressed, entirely absorbed in dance and totally unreceptive to backstage intrigue. Her inner strength, her human qualities—these explain why she has remained pure, untouched by the day-to-day hassle of theatre life. ↑ Rabochii i teatr (The Worker and Theater), (Leningrad, 1926, #9), 13. ↑ Galina Sergeevna Ulanova, The making of a ballerina (Moscow: Foreign Languages Pub. House, 1950, OCLC: 1502706). ↑ 3.0 3.1 3.2 3.3 Great Russian Women, Galina Ulanova Retrieved September 15, 2008. ↑ 4.0 4.1 4.2 4.3 4.4 4.5 4.6 4.7 Answers.com, Ulanova, Galina Retrieved September 15, 2008. ↑ 5.0 5.1 Karen Leigh, 60 Years of Heroes, Galina Ulanova Time Magazine. Retrieved September 15, 2008. ↑ The Ballerina Gallery, Galina Ulanova Retrieved September 15, 2008. ↑ Galina Ulanova Foundation, Biography Retrieved September 15, 2008. ↑ Galina Ulanova Foundation, About Ulanova Retrieved September 15, 2008. This page was last modified on 18 May 2017, at 14:59.